Hiện tại có 203 khách và 0 thành viên đang online. BeeProg2 là máy nạp rom đa năng có tốc độ nạp siêu nhanh, có khả năng giao tiếp với PC qua cổng USB hoặc cổng LPT. Máy nạp BeeProg2 thuộc loại mạnh nhất, hỗ trợ khả năng nạp được nhiều chủng loại chip nhất trên thị trường. Nếu bạn cần một máy nạp có chức năng tương đương nhưng giá thành hạ hơn thì có thể mua dùng máy BeeProg2C. - Bộ điều khiển 48-pin đa năng, đế nạp chuẩn 48-chân ZIF (kiểu chân cắm DIL). - Giao tiếp máy tính PC hệ điều hành Windows qua cổng USB/LPT. - Có khả năng nạp ISP/ICP (On-board). - Có chức năng kiểm tra IC (IC Tester). - Có khả năng kết nối nhiều bộ nạp này với nhau để hoạt động như một bộ nạp Gang (nạp được đồng thời và độc lập nhiều IC một lúc với một màn hình quản lý giao diện duy nhất). - Phần mềm điều khiển máy nạp được cấp miễn phí; thường xuyên cập nhật và tải được về từ Internet. - Tiêu chuẩn Bảo hành của hãng lên tới 3 năm. - Hỗ trợ nạp được rất nhiều loại chip khác nhau. - Nạp siêu nhanh, một trong số những bộ nạp nhanh nhất hiện có ngày nay. Nạp 64-Mbit NOR Flash memory ít hơn 9 giây và 1Gbit NAND Flash ít hơn 70 giây. - Dễ dàng sử dụng chương trình điều khiển chạy được trên tất cả phiên bản Windows từ Windows XP tới Windows 10 (32/ 64-bit). - Bộ nạp này còn có thêm chức năng kiểm tra IC (IC Tester) cho: các bộ nhớ và IC logic TTL/CMOS. Hơn thế nữa nó còn cho phép tạo ra các chuỗi mẫu kiểm tra người dùng định nghĩa được. 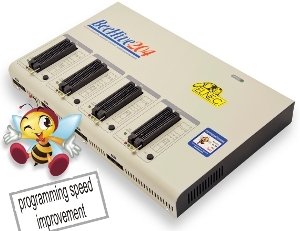 BeeProg2 programmer is practically identical with the BeeProg+ programmer, difference is "only" much higher programming speed (20-70%) of high-capacity memories, due to more powerful FPGA core inside. Bộ nạp BeeProg2 về cơ bản giống với bộ nạp BeeProg+, điểm khác biệt chỉ là tốc độ nạp nhanh hơn nhiều (20-70%) của các chip được nạp với dung lượng nhớ lớn, do bên trong nó có lõi FPGA mạnh hơn nhiều. 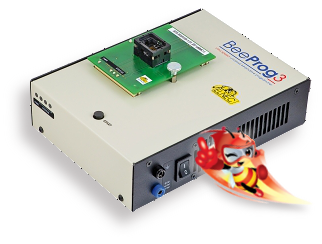 BeeProg2 is next member of USB/LPT-compatible, Windows 98/ME/NT/2000/XP/2003/XPx64/Vista/7 based ELNEC universal programmers, built to meet the strong demand of the small manufacturing and developers community for the fast and reliable universal programmer. Supports all kinds of types and silicon technologies of today and tomorrow programmable devices without family-specific module. You have freedom to choose the optimal device for your design. 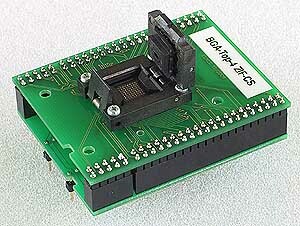 Using built-in in-circuit serial programming (ISP) connector, the programmer is able to program ISP capable chips in circuit. 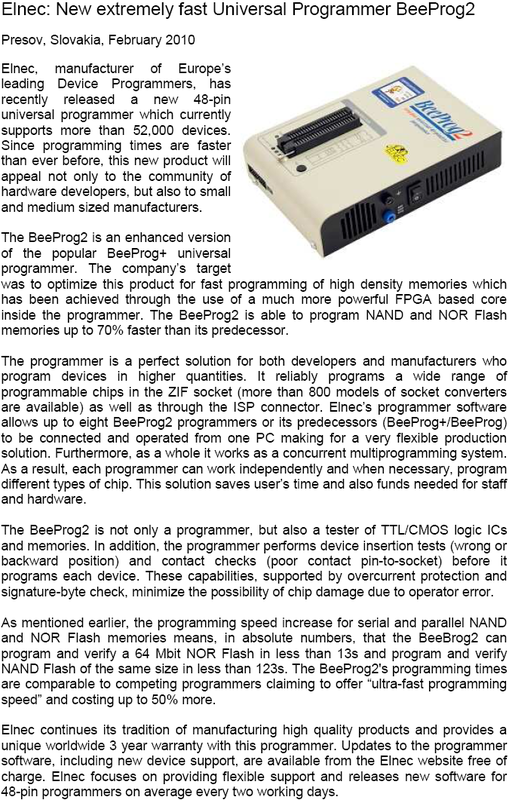 BeeProg2 isn't only a programmer, but also a tester of TTL/CMOS logic ICs and memories. Furthermore, it allows generation of user-definable test pattern sequences. 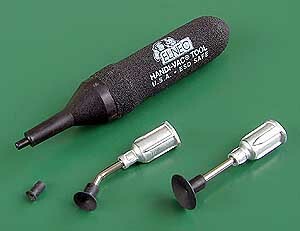 Provides very competitive price coupled with excellent hardware design for reliable programming. Probably best "value for money"programmer in this class. Extremely fast programming due to high-speed FPGA driven hardware and execution of time-critical routines inside of the programmer. Tests show, is faster than competitors in this category (status: 10/2009), for many chips much faster than most competitors. As a result, when used in production this one-socket-programmer waits for an operator, and not the other way round. 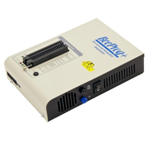 BeeProg2 interfaces with the IBM PC compatible or higher, portable or desktop personal computers through USB (2.0/1.1) port or any standard parallel (printer) port. 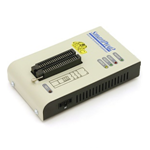 Programmer can utilize power of both USB high-speed port and IEEE1284 (ECP/EPP) high-speed parallel port. 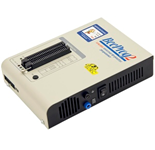 Support of both USB/LPT port connection gives you the choice to connect the BeeProg2 programmer to any PC, from latest notebook to older desktop without USB port. FPGA based totally reconfigurable 48 powerful TTL pindrivers provide H/L/pull_up/pull_down and read capability for each pin of socket. Advanced pindrivers incorporate high-quality high-speed circuitry to deliver signals without overshoot or ground bounce for all supported devices. Improved pin drivers drivers operate down to 1.8V so you'll be ready to program the full range of today's advanced low-voltage devices. The programmer performs device insertion test (wrong or backward position) and contact check (poor contact pin-to-socket) before it programs each device. These capabilities, supported by overcurrent protection and signature-byte check help prevent chip damage due to operator error. The selftest capability allow to run diagnostic part of software to thoroughly check the health of the programmer. Built-in protection circuits eliminate damage of programmer and/or programmed device due to environment or operator failure. 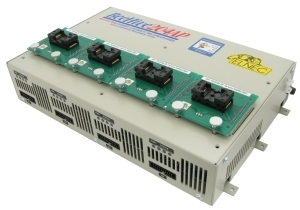 All the inputs of the BeeProg2 programmer, including the ZIF socket, connection to PC and power supply input, are protected against ESD up to 15kV. BeeProg2 programmer performs programming verification at the marginal level of supply voltage, which, obviously, improves programming yield, and guarantees long data retention. 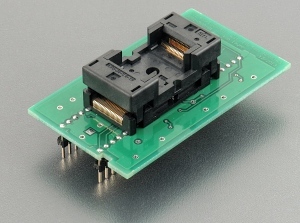 Various socket converters are available to handle device in PLCC, JLCC, SOIC, SDIP, SOP, PSOP, SSOP, TSOP, TSOPII, TSSOP, QFP, PQFP, TQFP, VQFP, QFN (MLF), SON, BGA, EBGA, FBGA, VFBGA, UBGA, FTBGA, LAP, CSP, SCSP, LQFP, MQFP, HVQFN, QLP, QIP and other packages. Programmer is driven by an easy-to-use control program with pull-down menu, hot keys and on-line help. Selecting of device is performed by its class, by manufacturer or simply by typing a fragment of vendor name and/or part number. Standard device-related commands (read, blank check, program, verify, erase) are boosted by some test functions (insertion test, signature-byte check), and some special functions (autoincrement, production mode - start immediately after insertion of chip into socket). All known data formats are supported. Automatic file format detection and conversion during loading of file. The rich-featured auto-increment function enables one to assign individual serial numbers to each programmed device - or simply increments a serial number, or the function enables one to read serial numbers or any programmed device identification signatures from a file. The software also provide a many information about programmed device. As a special, the drawing of all available packages are provided. The software provide also explanation of chip labelling (the meaning of prefixes and suffixes at the chips) for each supported chip. 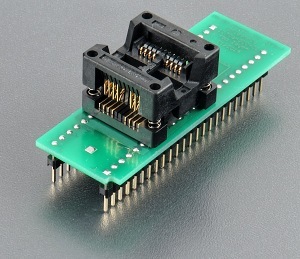 The software provide a full information for ISP implementation: Description of ISP connector pins for currently selected chip, recommended target design around in-circuit programmed chip and other necessary information. The remote control feature allows to be PG4UW software flow controlled by other application – either using .BAT file commands or using DLL file. DLL file, examples (C/PAS/VBASIC/.NET) and manual are part of standard software delivery. Jam files of JEDEC standard JESD-71 are interpreted by Jam Player. Jam files are generated by design software which is provided by manufacturer of respective programmable device. 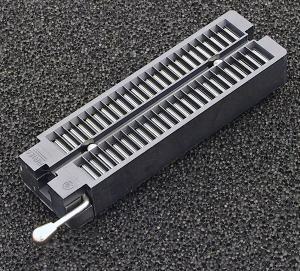 Chips are programmed in-ZIF or through ISP connector (IEEE 1149.1 Joint Test Action Group (JTAG) interface). VME files are interpreted by VME Player. VME file is a compressed binary variation of SVF file and contains high-level IEEE 1149.1 bus operations. SVF files are interpreted by SVF Player. SVF file (Serial Vector Format) contains high-level IEEE 1149.1 bus operations. SVF files are generated by design software which is provided by manufacturer of respective programmable device. 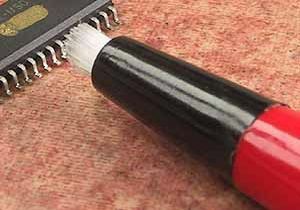 Chips are programmed in-ZIF or through ISP connector (IEEE 1149.1 Joint Test Action Group (JTAG) interface). VME files are generated by design software which is provided by manufacturer of respective programmable device. 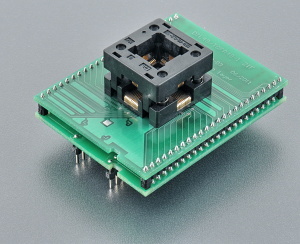 Chips are programmer in-ZIF or through ISP connector (IEEE 1149.1 Joint Test Action Group (JTAG) interface). Multiple devices are possible to program and test via JTAG chain: JTAG chain (ISP-Jam), JTAG chain (ISP-VME), JTAG chain (ISP-SVF) or JTAG chain (ISP-STP). 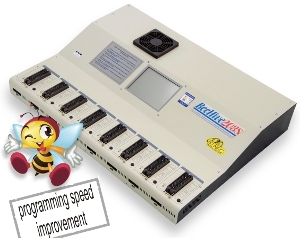 Attaching of more BeeProg2 programmers to the same PC (through USB port) is achieved a powerful multiprogramming system, which support as many chips, as are supported by BeeProg2 programmer and without obvious decreasing of programming speed. It is important to know, there is a concurrent multiprogramming - each programmer works independently and each programmer can program different chip, if necessary. 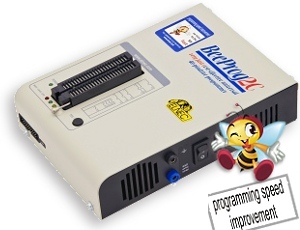 It is important to remember, that a support of most of the new devices requires only a software update, because the BeeProg2 is truly a universal programmer. With our prompt service you can have new device added to the list of supported devices within hours! See AlgOR (Algorithm On Request) service for details. Free software updates are available by download from our WEB site. Keep-Current and AlgOR services, our next step towards customer satisfaction. Keep-Current service means, that ELNEC ships the latest version of programmer software and updated user documentation (Keep-Current package) to customer . The Keep-Current service is your hassle-free guarantee that you achieving the highest quality programming on ELNEC programmers, at minimal cost. AlgOR (Algorithm On Request) service gives the user a tool to influence amount and types of programmed devices as needed. 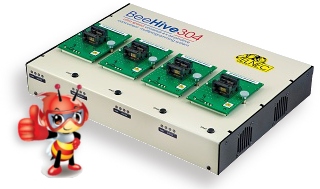 Advanced design of the BeeProg2 programmer, including protective circuits, original brand components, and careful manufacturing and burning allows us to provide a three-year warranty on parts and labor for the programmer (limited 25 000-cycle warranty on ZIF sockets). Online technical support (WebForm/e-mail based) is available within promised 24 hours time limit. 6 TTL pindrivers, provides H, L, CLK, pull-up, pull-down; level H selectable from 1.8V up to 5V to handle all (low-voltage including) devices. package support includes DIP, SDIP, PLCC, JLCC, SOIC, SOP, PSOP, SSOP, TSOP, TSOPII, TSSOP, QFP, PQFP, TQFP, VQFP, QFN (MLF), SON, BGA, EBGA, FBGA, VFBGA, UBGA, FTBGA, LAP, CSP, SCSP, LQFP, MQFP, HVQFN, QLP, QIP etc. It is important to say, we always use random numbers data pattern for programming speed testing. Some our competitors use "sparse" data pattern, where only few non-blank data are programmed or there are used data with only few 0 bits (FE, EF, etc.). This cheating approach can "decrease" programming time considerable. If you plan to compare, ask always which pattern they use. The programming speed depends on PC speed only slightly. If the programmer attached to PC through LPT port, the programming might take longer. Am29DL640G (parallel NOR Flash) 400080hx16 (64 Mega) programming and verify 24 sec. K8P6415UQB (parallel NOR Flash) 400100hx16 bit (64 Mega) programming and verify 13 sec. K9F1G08U0M (parallel NAND Flash) 8400000Hx8 (1 Giga) programming and verify 122.7 sec. QB25F640S33 (serial Flash) 800200hx8 (64 Mega) programming and verify 30.7 sec. AT89C51RD2 (microcontroller) 10000Hx8 programming and verify 14.4 sec. PIC32MX360F512L (microcontroller) 80000hx8 programming and verify 16.2 sec. Conditions: PC Pentium 4, 2.4 GHz, 512 MB RAM, USB 2.0 HS, Windows XP. Nuvoton, Aplusinc, Amiccom, PTC, Futaba, Thunder || Meritec, Sensata, Enplas, HSIO || ODA, Array || Inventec, Kakuhunter.